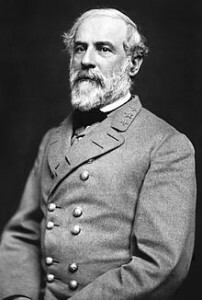 Robert E. Lee graduated from West Point in 1829, second in his class. Since the most promising graduates were customarily assigned to the Corps of Engineers, Lee became an engineering officer—and a brilliant one. It was, however, his heroic performance in the U.S.- Mexican War One of the illustrious Lees of Virginia – (1846-1848) that gained him his first fame. General Winfield Scott called him “the very best soldier I ever saw in the field.” With the outbreak of the Civil War, Abraham Lincoln offered Lee command of the Union armies. He refused, because he could not bring himself to take up arms against his “native country”—by which he meant Virginia—and, resigning his U.S. Army commission, joined the army of the Confederacy. Initially serving as military adviser to Jefferson Davis, he rose to become commander of the Army of Northern Virginia, principal force of the Confederate army. Typically outnumbered and outgunned, he nevertheless compiled a remarkable record of victory, produced by his uncanny tactical skill and his charismatic leadership. His defeat at the Battle of Gettysburg in July 1863 was the turning point of the war, and his surrender at Appomattox Courthouse April 9, 1865, was the symbolic end of the Civil War. Despite the bitterness of the conflict, Lee emerged from the Civil War as the nation’s most respected—even most beloved—military commander.